In the spring of 2016, freeride skiers Nico Zacek, Seb Michaud and Greg Hill made a long-time dream come true: travel to the Arctic Circle and ride Lofoten! The Viking era has long been over in Northern Norway, but the wilderness and untouched landscapes of the Lofoten archipelago still attract adventurers and outdoor aficionados to travel here and have the time of their lives. Countless couloirs, peaks and open snowfields allow freeskiing enthusiasts to spot the next mission from the road and start their tour right from the car. 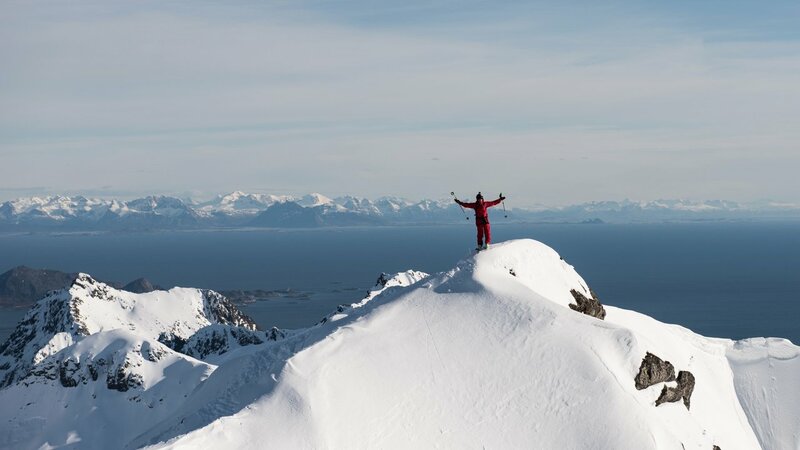 Lying within the Arctic Circle, Lofoten offers perfect freeriding and ski touring possibilities, especially during spring, when the sun disappears for no more than 4 hours a day. Freeskiing legends Seb Michaud and Nico Zacek joined forces and spent a week in the Lofoten Ski Lodge to ride untouched slopes in April 2016, and Canadian ski mountaineer Greg Hill even crossed the Atlantic to be part of the trip. No peak there rises higher than 1200m above sea level, so Nico, Greg and Seb literally started from the beach and skinned up the lonely mountains to draw their turns into the snowfields above the fjords. And while April in Central Europe means more or less warm weather, Northern Norway did not fail to send cold winds and temperatures below zero against the athletes. So before dropping into the next descent, the riders zipped up their GORE-TEX® Pro technology jackets and knew they wouldn’t have to worry about the weather. But the winds blowing over the islands also added an option no other place offers: Sail to ski spots you would normally not be able to reach by car or even by foot. Nico, Seb and Greg boarded the “SkyDancer” ready to conquer the next peak on their bucket list. Wearing GORE-TEX® products with GORE® C-KNIT™ backer technology, comfort was guaranteed both during the uphill climb and the following descent. The riders crowned this special day with backflips and big turns in front of one of the most magnificent backdrops Planet Earth has to offer. Save Up to 60% Off Sitewide on evo.com! "If i had to pick one ski to ride for the rest of my life, it'd probably be the Kartel 108."